I am a sucker for transparency. When the Aero glass theme first came out in Windows Vista, I was awed with how good it looked at the time. It still looks very nice to this day. Unfortunately, starting from Windows 8, Microsoft has started to divert away from transparency. In Windows 7, the aero glass was there to beautify the screen. However, Windows 8, 8.1 and then the latest, Windows 10 don’t have anything that would even remotely resemble the transparency of aero theme. I was searching on the web for enabling some ‘hidden’ theme of sort, which might allow me to get the transparent theme in Windows 10. This is when I came across the Classic Shell. 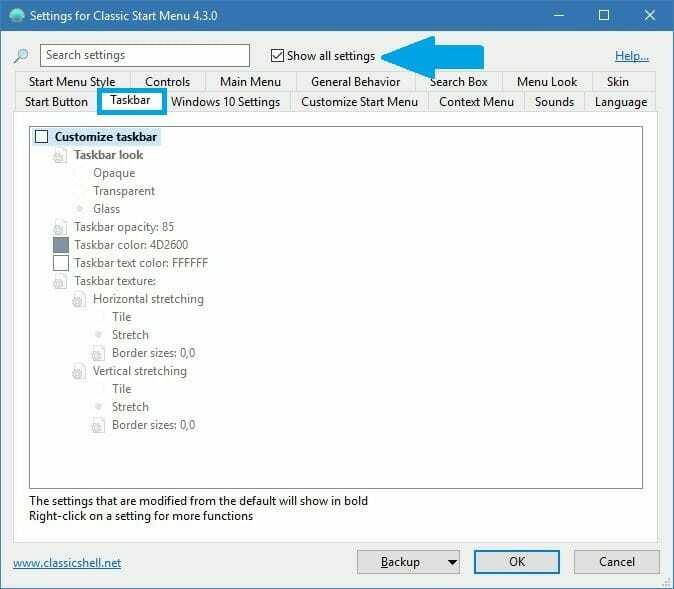 The Classic Shell is a start menu replacement utility for Windows. 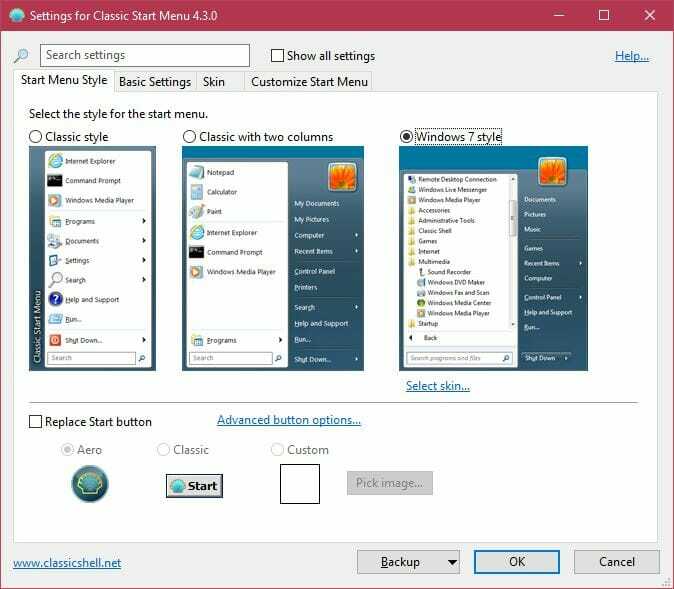 It can be used to get the older Windows 7 style start menu on any Windows version. I personally really like the newer start menu, so I have no reason to ever use it. Or this is what I thought until I came across the setting which allowed me to tweak the taskbar transparency. In this post, I’ll be showing you the instructions on how to adjust the taskbar opacity and transparency. For making the taskbar transparent, you will need to use the Classic shell. It has the option to set the taskbar transparency to our liking. To make it transparent, you can adjust the opacity value and get the results. Let’s continue with the steps. 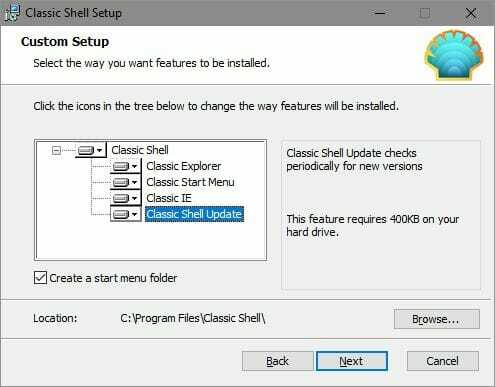 Download the latest version of the Classic Shell. Once downloaded, open the exe file downloaded and proceed with the setup by clicking on Next button on the first screen. Then, accept the license agreement and again click on Next button. This is when you’ll see the Custom setup screen. On this screen, you have the option of selecting the components which you want to install via the Classic shell. For the purpose of making the taskbar transparent, you only need the Classic Start Menu and Shell Update. However, I’ll be installing all fours given in the list for the sake of the tutorial. Once you have made your choice, click Next and then Install button. This will start the installation process which will take a few seconds to complete. Once done, click on Finish. Once the setup completes, you will be automatically greeted with the shell settings screen. Here, you can adjust the style and appearance of the taskbar and start menu. On this screen, click on the “Show all settings” checkbox. This will reveal a plethora of hidden settings for you to adjust including the one which you are after. Click on Taskbar tab and then check the “Customize taskbar” checkbox. This will reveal the options which can be used to make the taskbar transparent, opaque or whatever you want. In the Taskbar look heading, click on “Transparent” radio button. After this set the opacity to a number less than 50. You will need to edit the value from 85 (default) to 50 and then press enter. Depending on how you like, you can even set the value to 0 for truly hiding the taskbar. I generally set it to somewhere between 15 to 35. Once you have decided what value you want, click on OK to close the settings box. This is it. You can also reset to the default settings if you think that something doesn’t look right. For that, again head over to the settings for Classic shell. You can access the settings by right-clicking on the start menu icon and selecting Settings. From there, go the Taskbar tab again, select the opacity and press Ctrl + Space keys. This will set the default values for the taskbar.